Willpak Industries prides itself on providing innovative and value added products, which will help your company meet its many needs. Willpak is able to vacuum form products with precision and care. Each product manufactured by Willpak is custom designed and engineered to meet our customer’s standards. 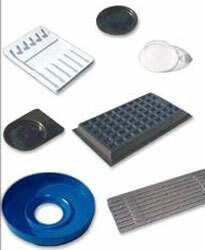 Willpak’s customers include the Automotive and Food Supply industries. We’ve also designed and manufactured products for the Aerospace Industry as well as products for the Home Garden sector. Common materials used during vacuum thermoforming procedures: ABS, Polystyrene, PVC, Polyethylene, Polycarbonate and Flocked Polystyrene. Please note we do not manufacture custom Rear Window Louvers.